The New Year snow failed to dampen buyers’ ardour in the Cotswolds, but it did present problems for dedicated estate agents trying to go about their lawful business. To be sure of completing the sale of the Old Vicarage at Compton Abdale, near Cheltenham (advertised in Country Life, November 11, 2009), Jamie Dalrymple Hamilton of Jackson-Stops & Staff in Cirencester spent half a day digging out the drive so that the removals van could get in (the van driver declined to help), rather than risk incurring a forfeit for late completion. 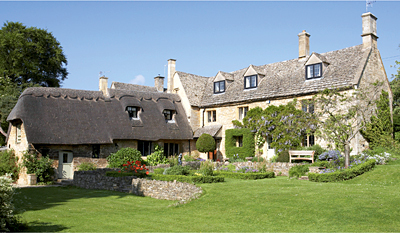 ‘Period properties in need of renovation are much in demand, but although the current level of interest is encouraging, it appears to be largely restricted to new properties entering the market; in this “quick-hit” environment, properties outstanding from 2009 need to be keenly priced in order to compete,’ he says. Good schools are always a major draw for family buyers moving to the Cotswolds, and the recent closure of several prep schools has boosted the popularity of villages around Stroud, which boasts two of the country’s top-performing State schools: Marling School for boys and Stroud High School for girls. It has also led to increased demand for day-places at Beaudesert Park School at Minchinhampton, between Cirencester and Stroud. Across the valley from Beaudesert Park, and a mile from the market town of Nailsworth, lies the thriving village of Horsley, on the edge of which stands 17th-century Nupend Court, listed Grade II, which is set to come to the market at a guide price of £950,000 through Jackson-Stops & Staff (01285 653334) and Murrays (01453 886334). Prior to his death in November last year, Nupend Court was the home of international banker John Gray, who was chairman and chief executive of HSBC in Hong Kong from 1993 to 1996, a sensitive time on the run-up to the colony’s handover to China the following year. Built of Cotswold stone under a stone-tiled roof, the charming family house has glorious views of the Cotswold Hills. The accommodation, which needs ‘basic modernisation’, includes three reception rooms, a kitchen/breakfast room, master and guest suites, three further bedrooms and a further bathroom. It also has a garage block with a games room above it, plus outbuildings, a landscaped garden and a paddock-1½ acres in all. Having failed to secure a buyer in the depths of the recession for historic, Grade II-listed Pigeon House at Southam on the lower slopes of Cleeve Hill, near Cheltenham, its owner has bowed to market forces and re-launched the former medieval manor house through Knight Frank (01242 246959) at a guide price of £1.3 million, reduced from £1.5m. Once part of the substantial Southam estates owned by the Delabere family, the building was the local priest’s house before becoming a farmhouse following the dissolution of the monasteries, when it was renamed Pigeon Cote Farm. In the early 1920s, the property was bought at auction by a Mr T. E. Whittaker on the death of the last Duke of Ellenborough, when the estate was split up and the farms sold off. With the help of his architect John Coates Carter, Whittaker renovated and remodelled the building, exposing the original timbers, and adding the stone entrance porch, the bay windows in the drawing room and entrance hall, and some very fine leaded-light and stained-glass windows. Despite changing hands several times since then, the fabric of the house has remained largely unaltered. Secluded Pigeon House stands in a quiet corner of the village overlooking Southam’s famous Tythe Barn, Grade II*-listed hotel, medieval Church of the Ascension and Cleeve Hill. It has 5,420sq ft of accommo-dation on three floors, including five reception rooms, a conservatory, a garden room, five bedrooms, three bath/shower rooms, and 1½ acres of lovely walled gardens and grounds. Orchard House at Old Minster Lovell, near Witney in the Oxfordshire Cotswolds, was another early casualty of the recession, failing to sell at £1.5m while still in need of modernisation. Undaunted, the joint owners, who inherited the 1930s house, with its spectacular views across the Windrush Valley, decided to renovate Orchard House themselves. It is now back on the market with Savills (020-7499 8644) at a guide price of £1.75m. Selling agent Luke Morgan, who has already received offers around £1.7m from a couple of London buyers, recommends roomy Orchard House as ‘perfect for people who don’t like banging their heads on the low ceilings often found in older Cotswold houses’. It stands in more than two acres of charming Cotswold-stone walled gardens and grounds and has three reception rooms, a kitchen/breakfast room, master and guest suites, five further bedrooms, two bath/shower rooms and a large attic space. For the past two years, the market in the Cotswolds has been dominated by classic village houses in the £750,000 to £1.5m price bracket. Good country houses with land in the £2m to £3m price bracket have been conspicuous by their absence. In a rare instance of vendors trading up instead of down, the owners of idyllic Mary’s Acre (pictured) at Broad Campden, near Chipping Campden, took two years to find the country house of their dreams through Strutt & Parker in Moreton-in-Marsh (01608 650502). That deal completed, the same office is now handling the sale, at a guide price of £1.45m, of the charming 17th-century, Cotswold-stone house with an early 18th-century addition. Immaculate Mary’s Acre, listed Grade II, stands in just under an acre of beautifully landscaped gardens, and has accommodation on three floors, including three reception rooms, a kitchen/breakfast room, a study, a wine store, five bedrooms and three bath/shower rooms.